Your dream is to run your own farm, but your father is very skeptical of your current abilities. Daryl and Frank have collaborated together to give you a set of tasks to guide you on becoming a great farmer. As you complete the chores given to you, you will become a better farmer and perhaps finally receive your father's blessing to follow your dream. There are three advice guides that you'll be given will increase in difficulty as you complete the prior one. Your first set of chores will be given to you by Uncle Frank on the morning of Summer 1 of your first year. He will stop by your house to explain that the brothers want to teach you more about farming, so he has a list of tasks that a farmer should be experienced with. When you complete all of the tasks in the advice guide, Uncle Frank will stop by a few days later to give you the next set of chores. The list of chores will be found in your Community Menu. Press the X Button on your Nintendo 3DS to open the menu, then select the Farming Tips menu. There are a total of 12 tasks you will need to complete; three tasks in Farming Tips #1, four tasks in Farming Tips #2, and five tasks in Farming Tips #3. Completing these tasks will expand the amount of farm area you can use. Great farmers have more farm space to utilize! Regardless of what you have harvested before, only the crops you grow since receiving the advice guide will count. All you've to do is grow three different types of crops and then harvest them once they're mature. You don't have to ship the crops to a specific destination. Your farm comes with one livestock barn, so you'll want to hire Ludus to build a second barn. The basic livestock barn Farm Circle requires 20 Brick, 20 Lumber, 10 Small Lumber, and 1500 G (or 1050 G in Seedling Mode). A cow will cost you 5000 G (or 3500 G for Seedlings) at the Love Animal shop in Westown. Any two cows will complete this chore, and you can sell the extra cow the next day if you want to. Either normal cows or Jersey cows will complete this chore. Frank and Daryl want you to upgrade your house to level 1. If you have already done this, then the task will automatically be marked as completed on your advice guide! 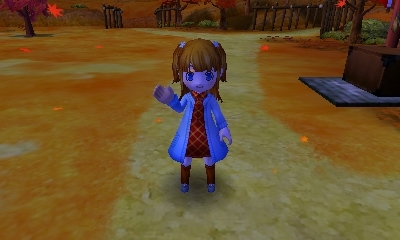 If not, you'll need to head to Ludus' shop in Lulukoko Village. The level 1 farm house upgrade costs 20 Small Lumber, 10 Lumber, and 5000 G (or 3500 G in Seedling Mode). You'll need to have the level 1 house if you want to use your kitchen or change your clothing. After you finish your first farmer guidance chores, Frank will stop by your house and explain that you've earned more farm land to work on. The western side of your farm will be opened up for you to use. This area also has a fishing dock. Once your farm house is level 2 or higher, a few days later you might find a visitor at your front door. Your little sister, Lynn, has a few days off from school and has come for a visit to see how you're doing with your farming. Your sister will stay on your farm, wandering around the land and inside of your house. Talking to her during this time might trigger a farm information event, where Lynn will ask you questions about how your farm works, if you like crops or animals or both, and so on. Lynn will comment on how you seem to be a different person since she last saw you. She doesn't have a life dream yet, as she's still just a kid, but she admires how you have set out to follow yours. Daryl was strongly opposed to your plan, but when she returns home she plans on telling him how well you are doing. Lynn only stays on your farm for a couple of days. When she's ready to leave, you'll take her to the coach stop in Westown where you and Uncle Frank see her off. Lynn will reveal that she left you something under your bed back at the farm house, so head back and press the A Button on the north side of your bed to discover she left you some sweets to eat. You'll need to go through Lynn's visit before you can receive the next farm challenge. After Lynn leaves, a few days later Uncle Frank will stop by your house to give you the next set of farm challenges. These are a little more difficult than the first set, but you can do it! If you happen to enter a Animal or Crop festival at Veteran rank or higher, you now have a chance of running into the mysterious Mr.D. This masked man is also competing in these two judgment festivals and is eager to have you as a rival. Who is Mr.D? The destination to where you ship the crop won't matter, as long as it is at least 2 stars of Star Rank or higher. You can raise the Star Rank of your crops by utilizing fertilizer. As you raise each of the crop's qualities, its Star Rank will increase as well. For crops that regrow (Tomato, Corn, Eggplant, etc.) you can continue to apply fertilizer after each harvest to continue to raise the crop's Star Rank. For single-harvest crops (Cabbage, Turnip, Onion, etc.) you'll need to utilize the Seed Maker Farm Circle to convert your crops back into seeds and then replant to apply more fertilizer. A 2-star flower that you've grown on your farm can also be used to complete this task. The Star Rank of your animal products are based on the Affection of your animals. This is pretty easy to increase just with some simple animal care; feed and interact with the animals every day, and try to buy a few pets that can herd them outside of their barns on good weather days. You can ship either an egg, milk, or wool to complete this chore. Since you may need this Farm Circle to complete the 2-Star crop tasks, head to Ludus' shop in Lulukoko to purchase a Seed Maker. This object appears in Ludus' Farm Circle inventory after you complete Farm Advice #1. 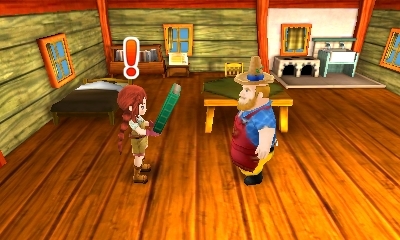 You'll need to hand over 20 Lumber, 10 Small Lumber, 10 Glittering Stone, 3 Topaz, 2 Ruby, and 20,000 G. The Glittering Stone, Ruby, and Topaz are found when mining in Westown but you can also buy Ruby and Topaz from Logcabin if you have Westown at Town Link Rank B or higher. You can't buy Glittering Stone. Once crafted, place the Seed Maker out on your farm to finish this task. If you already have the Seed Maker out on your farm when you receive Farm Advice #2, the task will automatically be marked as completed. This Farm Circle will convert your milk into cheese, butter, and yogurt. Head over to Ludus' shop to purchase the Milk Maker for 20,000 G, 30 Iron, 20 Stone, and 20 Milk. If you don't want to mine for Iron, you can buy it from Log House material shop in Westown for 900 G each once Westown is Town Link Rank C or higher. Log House also sells Stone for 400 G each. Have Ludus craft the Dairy Factory and place it out on your farm space to mark this tasks as completed. The next day after you finish these tasks, Frank will stop by and tell you that you've earned even more land to work on. Now the area to the south of your farm is available for you to use. A few days later you'll receive another visitor. This time it is your mom, Marlena. Lynn told her all about her visit to your farm and she had so much fun that Mom decided to stop by to check it out. Don't worry, your dad and Lynn will be fine. Marlena will hang out inside and outside of your farm house for a few days. One morning, mom will ask you to take her shopping. 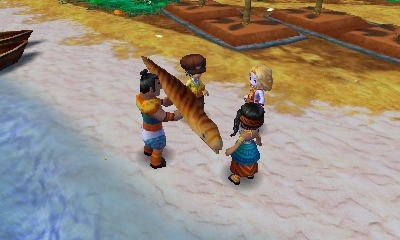 She'll be impressed by the beauty of Lulukoko Village and asks if you ship the things that you grow on your farm to Lulukoko; you can answer that you do or you don't. Either way, your mom will ask you to show her around the village. It's like a vacation! It's too bad your dad and sister are left home alone, but if she had the chance she'd like to spend more time visiting your farm. Marlena admits that they've been inspired to start a little garden of their own. Just a small planter to grow herbs in, but your sister checks on it every morning when she gets up. Your father has been traveling on business once per month, but he reads the letters that Uncle Frank sends about you. When he received news that you completed the second set of tasks he gave you, your father locked himself in his bedroom. He wasn't expecting you to clear the chores so quickly, so the next tasks he sends you will be more difficult. Marlena says that your father still sees you as his child and wonders why he can't be satisfied that you're growing up. He's the one acting like a child, in her opinion. Your mom will ask if you are angry with him for being against your dreams as a farmer, which you can reply that you think it is or isn't. Mom will head back home after a few days. You'll accompany her to the stagecoach in Westown. Before she leaves, Marlena will tell you to continue to follow your dream. When you get back to your house, check the kitchen to find a little bit of fun money from mom. The day after mom leaves, Uncle Frank stops by with your last set of chores from your dad. This time you have five tasks to complete. Now that you have these final set of tasks, Lynn will stop by for a second visit a few days after Uncle Frank gives you the chore list. This time she will simply hang out on your farm and leave a few days later. You have to increase the Town Link Rank of each town to Rank B or higher. You'll do this by completing part-time jobs, shipping to the town, and so on. You will have to complete the link rank locks as well. As you win the harvest, cooking, and animal festivals, you'll increase your Brand in those categories. The higher the Brand you have, the more money you'll earn when shipping those products. Your dad wants you to increase your Brand 9 times, and any brand upgrades you've already earned from festival wins will count. This task might already be marked as completed when you receive it, or at least close to being marked as completed. 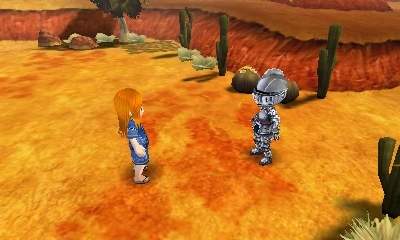 Note that in the English version of the game, the task vaguely asks you to "harvest 9 branded items" instead of to raise your brand 9 times. An easy way to take a big brand jump is to participate in the full-course Cooking Contest. During the full-course competition you will cook dishes in multiple categories. If you win the contest, you will increase your brand in every category you cooked a dish in. Your dad wants you to earn 500,000 G. It won't matter which town you ship to, as long as you earn that much in total since you received your dad's challenge. Ship a Lot of One Item! It won't matter which town(s) you ship to. You just need to ship 1000 of any combination of harvested crops and animal products. The English version also makes a slight error in this description, requesting you to ship 1000 of a unique item instead of ship 1000 items in total. Your rival, Mr. D, is anxious to see what you can do. Your dad has tasked you with defeating Mr.D in a harvest or animal festival. Your rival will appear in either of these festivals when you enter at difficulty rank Veteran or higher, but to complete this task you need to win at Expert rank or Legend rank. You have to win against him once before he'll start to get serious and becomes the challenge that you need to defeat. Beating Mr. D may require you to enter a crop or animal that is more than what you would expect to win the festival. Submitting an entry that you might feel like, "Oh I've a good chance of winning" might not be enough to take the victory from Mr. D. He is really tough to win against! If you persist eventually you will take first place from him. When you do win against Mr. D, he explains that this will be his last competition. In his younger days he was a farmer, but life took him down a different path and he had to give it up. You explain to him your goal of becoming a great farmer and earning your father's respect, and Mr. D tells you that he thinks your dad would be proud of what you've accomplished. In the morning after you complete your last task on your list, Uncle Frank will stop by for a visit to congratulate you on a job well done. He invites you back to his house for a party. 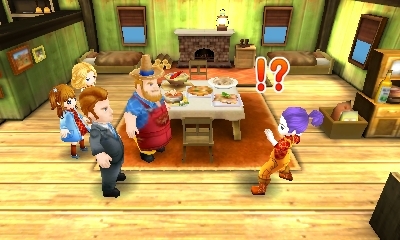 As you look out on the feast he made, you discover that your mom, Lynn, and even Mr. D were at the party. He's pleased about how far you've come as a person and as a farmer, as it seems to run in the family. What does he mean? Turns out 'ol Mr. D is Daryl! Dad admits that he was worried about you and that given the argument the two of you got into, he felt he needed to disguise himself to see you. You were a worthy rival and have grown into an excellent farmer. If you still want to be a farmer, Daryl is more than willing to give you his blessing. Now it's time to party as a family! After the party, you and your dad privately talk by the river. He asks if you really didn't know that he was Mr. D, which you can respond that you did or didn't; either option is okay. He tells you that mom and Lynn figured out what was going on pretty early and were jealous that he got to see you more often then they did. Daryl explains that he quit farming back when his father (your grandfather) became sick. He was a trader about the same time that Daryl started farming with Frank. His dad became unhealthy soon after starting his own trading business, and always looked sad when he thought of having to give up the business he worked so hard to create. Daryl took over his dad's business to help him feel better and eventually grandpa recovered enough that they worked together. After that your dad met Marlena, and then you and your sister came along. He was surprised to hear that you were interested in farming, since he had some familiarity with how hard it is. He admits that there wasn't anything to worry about and asks that you stay as a farmer for a long time, as it is a noble profession in his opinion. Lynn finds the two of you and asks you to come back to the party. They brought out the old family photo albums and are going to look through them. Together you go back to Frank's farm house to enjoy the party. At this point the game's ending credits will roll. 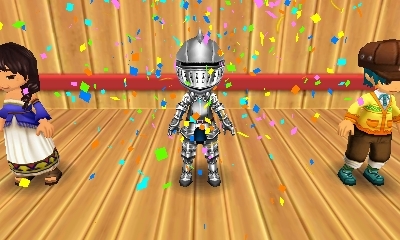 The game will continue onto the next day from the date you had the party with your family.